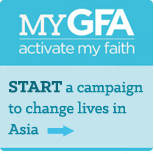 Another way to give is through a MyGFA campaign. This is a great way that you can raise funds for a specific need of suffering women! Through MyGFA you can help eliminate illiteracy from women.